The Super Swimmers Foundation is dedicated to teaching all children with autism and special needs to learn to swim both safely and successfully in the water. Through swimming the mind and body are both stimulated therefore improving a child’s speech, muscular development, and confidence in a fun, loving environment. Julie Gross along with her dedicated team of professional swim instructors is making the dream of having a super center that promotes both education and physical fitness for the community a reality. They see the benefits of swimming on a daily basis and they are proud to provide swimming lessons, guidance and support to families with autistic and special needs children. Julie Gross and the Swim With Mr. Blue team are CPR/First Aid certified, and Lifeguard certified. They provide the motivation and encouragement needed to help swimmers learn to swim safely and successfully in a safe gentle environment. Through a variety of colorful characters providing visuals, repetitive swim safety songs, and association tools Miss Julie's lessons are beneficial for those children requiring specific learning needs. She has a wonderfully entertaining DVD filled with fun songs and a motivational story of a fish named Mr. Blue that capture a child’s imagination and make learning to swim fun. Julie and her team are proud to be involved in the support and education of autism. They understand that it is the efforts of a community working together that creates a healthy environment for children to learn and grow. Through the Super Swimmer’s Foundation Julie and her team will work with their community to provide further resources for parents, children and families of autistic and special needs children. 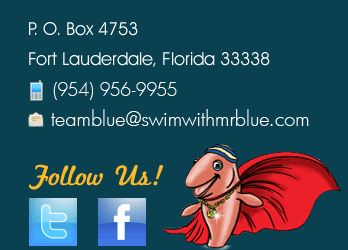 For more information on The Super Swimmer’s Foundation, please call (561) 755-7254.